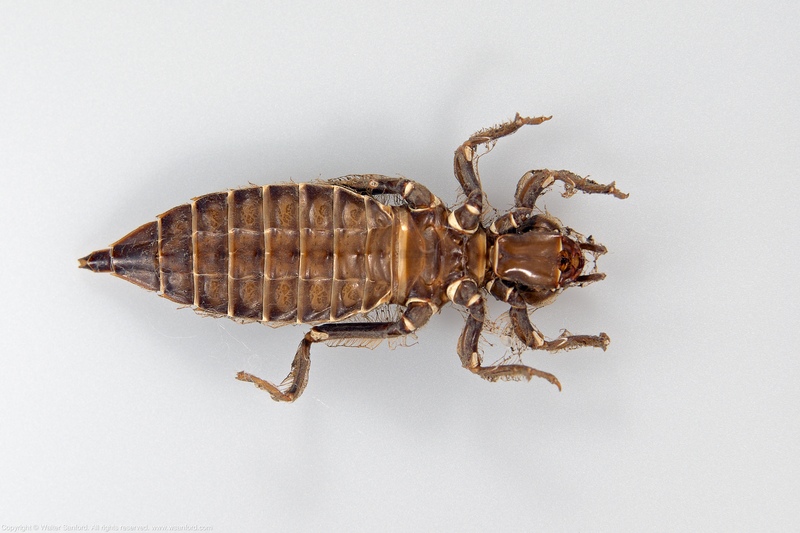 A larva/nymph in the Family Gomphidae (Clubtails) was collected by Bob Perkins from the New River in southwestern Virginia. The larva died before it metamorphosed into an adult. Test shots of this beautifully preserved specimen were taken using a small-ish aperture of f/11 for greater depth of field. The following photos are “one-offs,” that is, not composite images. Bob’s best guess of the identity of the specimen is Phanogompus sp. I see several similarities between this larva and a Phanogomphus lividus exuvia (Ashy Clubtail) in my collection, so Bob’s tentative identification might be correct. More later after the specimen is keyed out. 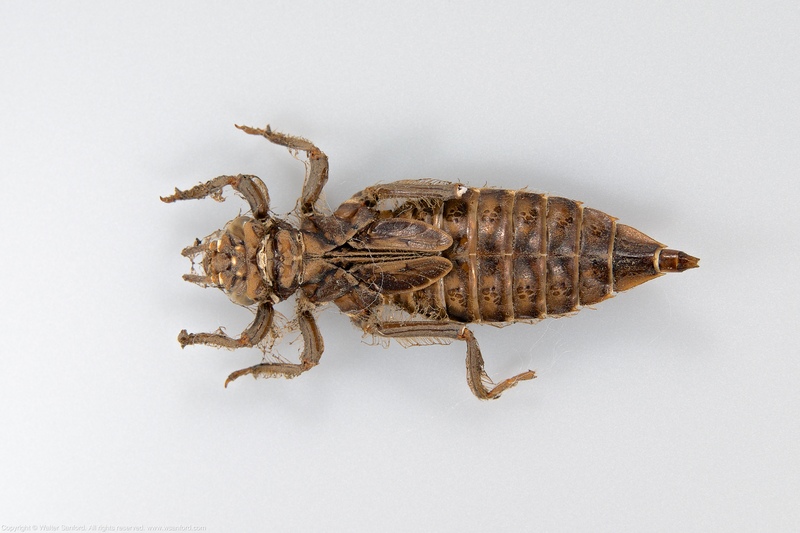 This individual might be female, as indicated by the rudimentary ovipositor that can be seen on the ventral side of the specimen along the boundary between abdominal segments eight and nine (S8-9). The following equipment (shown below) was used to shoot the preceding photos: Fujifilm X-T1 digital camera; Fujifilm MCEX-16 extension tube; Fujinon XF80mm macro lens; Godox XProF TTL Wireless Flash Trigger for Fujifilm cameras; Godox TT685F Thinklite TTL Flash for Fujifilm Cameras; Godox TT685C Thinklite TTL Flash for Canon Cameras fitted with a Lastolite Ezybox Speed-Lite 2 flash modifier; and a Canon 580EX II Speedlite mounted on a Godox X1R-C TTL Wireless Flash Trigger Receiver for Canon. A new Godox TT685O Thinklite TTL Flash for Olympus/Panasonic Cameras was added to an array of radio-controlled external flash units used to light the specimen. All flashes were set for Manual Mode at 1/128 power. Adobe Photoshop CC 2017 was used to spot-heal and sharpen the final output. Gear used for studio macro photography. By the way, in case you looked at the preceding photo and wondered “What’s up with the crazy crop?” I used Photoshop to conceal some of the clutter in my kitchen. 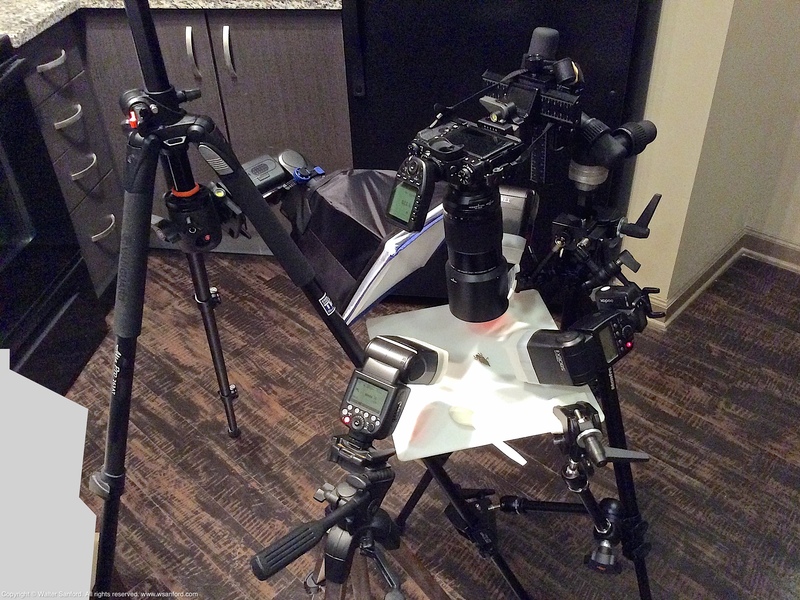 I set up my macro photo rig in the kitchen because it’s the largest uncarpeted area in my tiny apartment. Padded carpet is a poor surface for macro photography — the field of view from a tripod-mounted camera-lens-flash trigger combo shifts noticeably (and unacceptably) as one moves around the rig. This entry was posted on February 11, 2019 at 4:00 am and is filed under Aperture, Canon 580EX II Speedlite, digital photography, dragonflies, extension tubes, Fujifilm X-T1, Fujinon XF80mm macro lens, Godox TT685C, Godox TT685F, Godox TT685o/p, Godox X1R-C, Godox XProF, How To, Lastolite flash modifier, macro photography, natural science, Photoshop, wildlife photography. You can follow any responses to this entry through the RSS 2.0 feed. You can leave a response, or trackback from your own site.